This graph displays three surface plots intersecting with one another. Transparency has been applied so that all data points remain visible through overlapping surfaces. 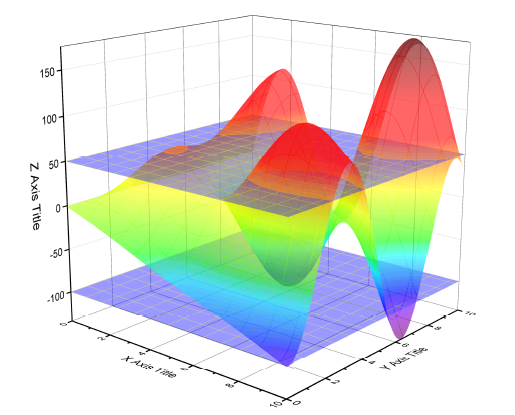 These kinds of plots can be created directly from data stored in matrix objects. All matrix objects in intersecting surface plots must be located in the same matrix sheet in an Origin matrix window, thus sharing the same dimensions and coordinates. In this example, source data for the intersecting surfaces is stored in three matrix objects in Msheet1. Click thumbnails to switch between them. With the first matrix object (Amplitude) active, click the 3D Surface button to plot these intersecting surfaces. You are allowed to customize the function plot in the function tab of the Plot Details dialog.